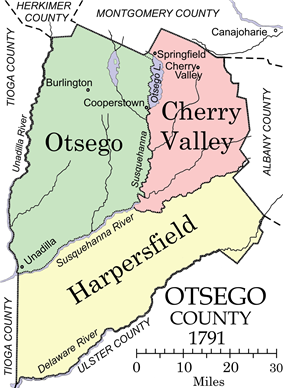 Otsego County is a county located in the U.S. state of New York. At the 2010 census, the population was 62,259. The county seat is Cooperstown. 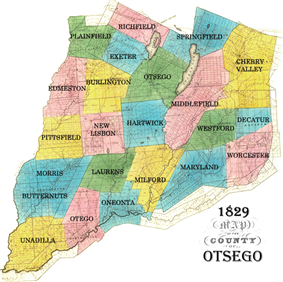 The name Otsego is from a Mohawk word meaning "place of the rock." Otsego County comprises the Oneonta, NY Micropolitan Statistical Area. The area of Otesgo County was reduced by a number of subsequent splits. Otsego County is in central New York State, to the west of Albany, southeast of Utica, and northeast of Binghamton. 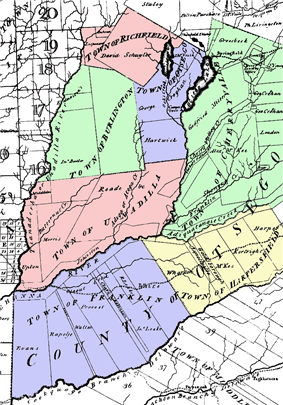 The county is part of the Mohawk Valley region of New York State. The county is considered by some to belong to the Southern Tier region of New York State. According to the 2000 census, the county has a total area of 1,015 square miles (2,630 km2), of which 1,003 square miles (2,600 km2) is land and 12 square miles (31 km2) (1.21%) is water. The Village of Cooperstown (home of James Fenimore Cooper), located at the south end of Otsego Lake, attracts many tourists to the Baseball Hall of Fame and the New York State Historical Association museums. Its primary industry is healthcare as it is home to Bassett Medical Center, the headquarters of Bassett Healthcare Network and its more than 3,000 employees. The City of Oneonta is the home of Hartwick College, the State University of New York at Oneonta, A.O. Fox Memorial Hospital an affiliate of the Bassett Network, major retail activity, and numerous small businesses. The county as a whole remains relatively rural, with dairy farming a contributing industry that has consolidated employment in recent years, although production has remained steady. In the county the population was spread out with 22.70% under the age of 18, 14.40% from 18 to 24, 24.30% from 25 to 44, 23.60% from 45 to 64, and 15.00% who were 65 years of age or older. The median age was 37 years. For every 100 females there were 93.10 males. For every 100 females age 18 and over, there were 90.00 males. Otsego County is a true swing county and bellwether; it has chosen the winner of the presidency for the last three decades. In 2004, Otsego County voted 51-48 percent in favor of Barack Obama. Democrats are prevalent in the City of Oneonta and Village of Cooperstown, and the majority of voters in many of the surrounding towns are registered Republicans. Otsego County is the only county in New York that names its legislative body the Board of Representatives, which consists of members from 14 single-member districts. The Board Chair is Kathleen Clark (R). The county also has a County Attorney, County Auditor, County Clerk, and County Sheriff. ^ a b "State & County QuickFacts". United States Census Bureau. Retrieved October 12, 2013. ^ "U.S. Decennial Census". Census.gov. Retrieved October 12, 2013. 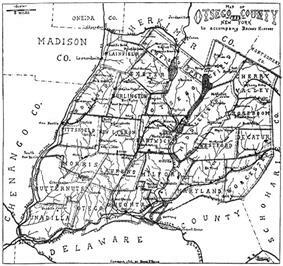 Lyman H. Butterfield, "Cooper's Inheritance: The Otsego Country and its Founders", New York History, Vol. 35, No. 4 (October, 1954), pp. 374-411.